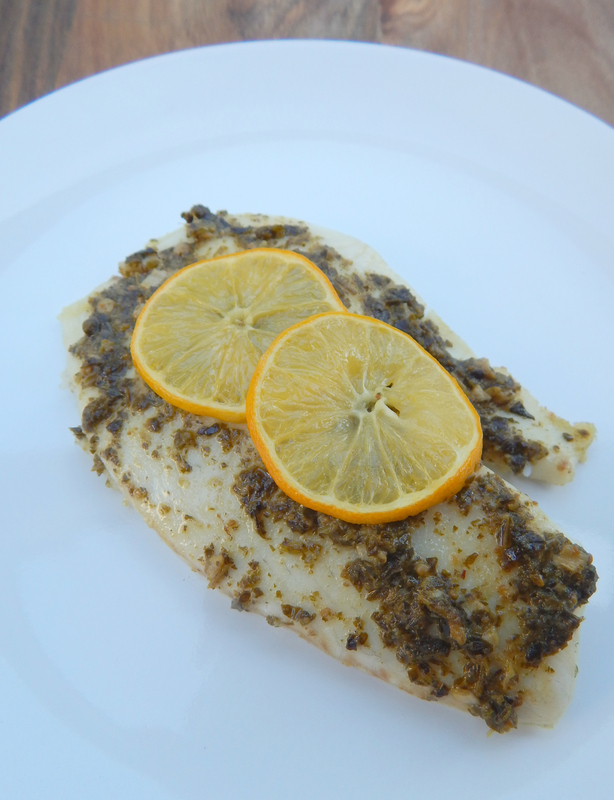 Enjoy juicy, flakey tilapia fillets baked with a coating of flavorful basil pesto and topped with bright lemon slices for a little citrus kick! During the week I get home from work pretty late, and I don’t have time to spend forever on dinner. This is the perfect recipe to make for a weeknight dinner! It uses ingredients I usually have on hand, and it only takes 20 minutes. The recipe only takes 5 minutes to prep and while the fish is baking I can cook up some veggies to go on the side or my hubby can make us a quick salad. We loved this dish so much that I cooked it for us for three days in a row! I buy a large bag of frozen tilapia fillets from Sam’s Club. The brand is Treasures from the Sea by Odyssey, and each fillet comes individually wrapped so you can use as many as you need at a time. It is about $14 and comes with about 15 fillets. I find it to be a really good bargain for quality fish! 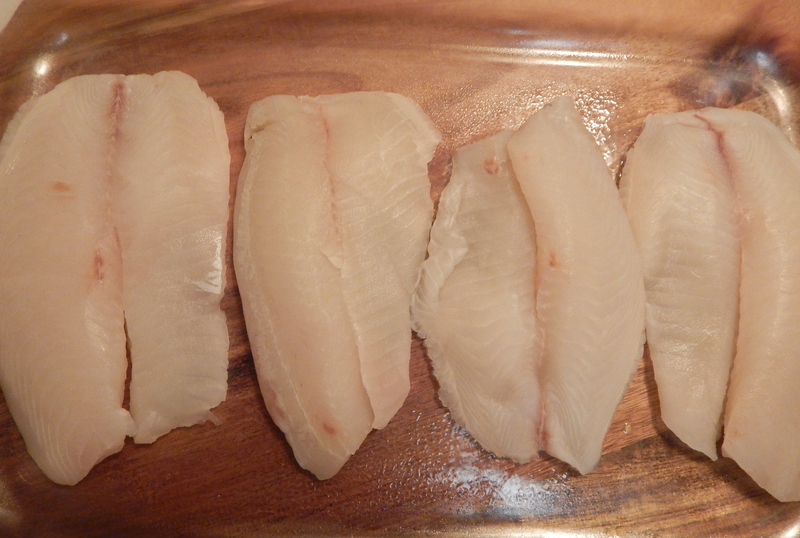 Start with thawed tilapia fillets. That part is important! They thaw really quickly in a bowl of water. The directions are on the package. I basically fill a large bowl with cold tap water and throw in the fillets still in their individual plastic wrap. There are only a couple of steps to this recipe, and I photographed each so you can get a visual. You can use your favorite store bought pesto or you can make your own, but since this is a quick weeknight meal for us I just use a jar of Classico pesto. This is what the dish looks like when it comes out of the oven. 1. Preheat oven to 400 degrees. Spray a shallow baking pan or casserole dish with cooking spray or spread the olive oil to coat the bottom of the pan. 2. Line a large plate with paper towels and lay the thawed tilapia fillets on the paper towels in a single layer to dry off some of the excess water. Gently pat dry with more paper towels. 3. 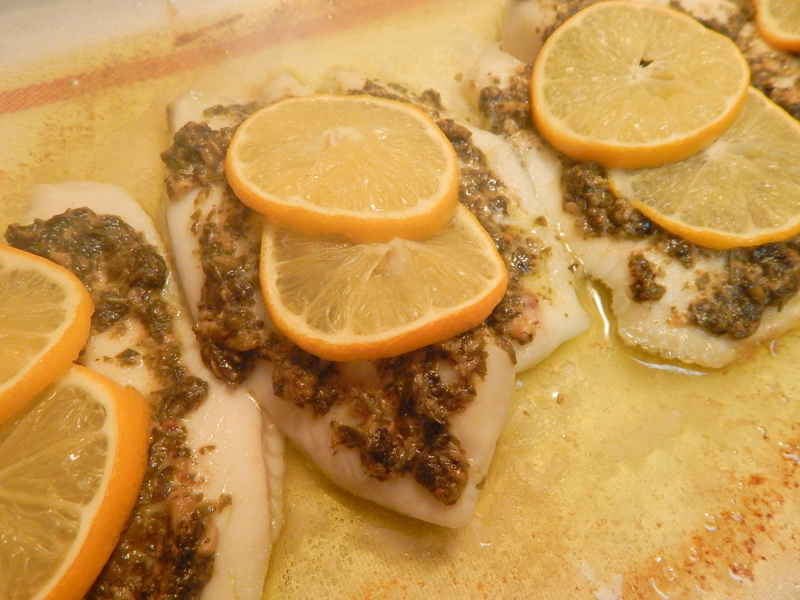 Place the tilapia fillets on the baking dish in a single layer. 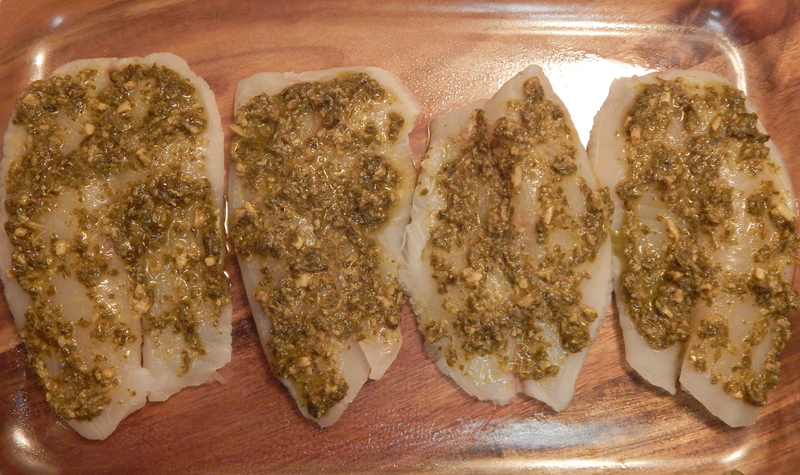 Spoon 1 tablespoon of pesto onto each fillet and spread to cover the fillet. 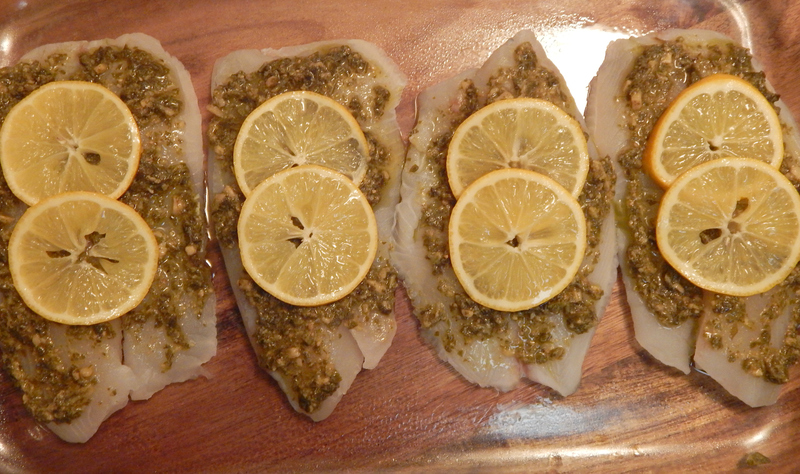 Top each fillet with 2 thin slices of lemon. Place the baking dish in the oven and bake for 15 minutes. Remove from the oven and enjoy! 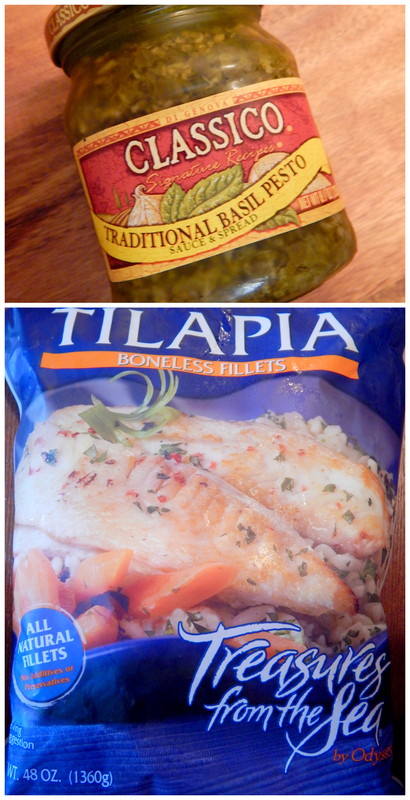 • I used frozen tilapia fillets from Sam’s Club. 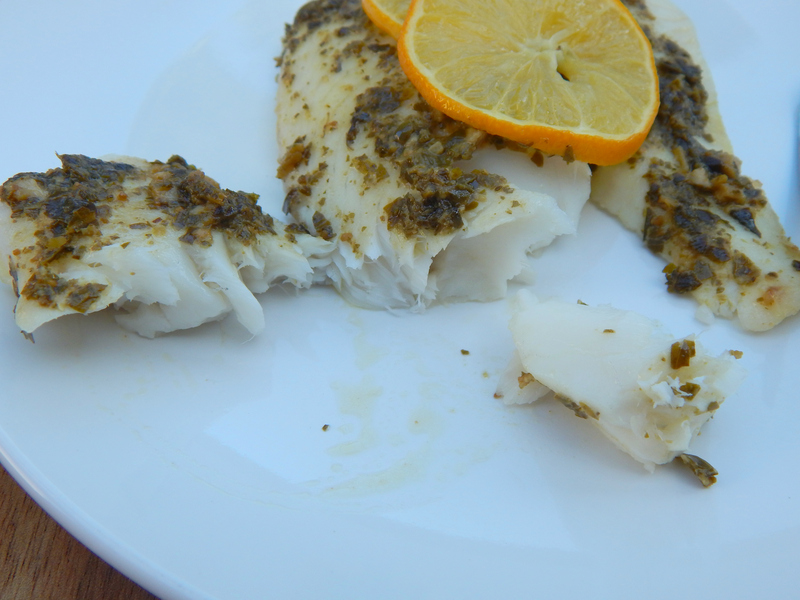 Make sure the fillets are fully thawed before using in this recipe. • I used Classico Traditional Basil Pesto. I find this in the pasta and pasta sauce section of the grocery store.